Ruth's Chris, one of the Hartford area's best bets for steak, is known for its tender Midwestern cuts served sizzling in butter. 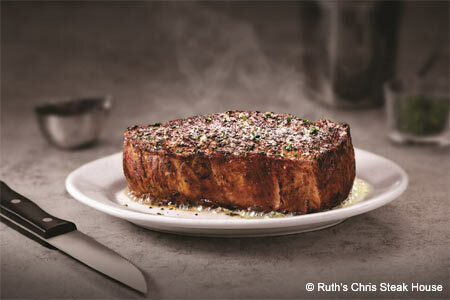 : Connecticut's only Ruth's Chris is one of the Hartford area's finest steakhouses. The New Orleans-born chain is known for its quality cuts of corn-fed Midwestern beef, broiled at 1,800 degrees and served tender and sizzling in sweet butter. This is no cheap night out, as everything from the chopped salad topped with crispy onions to classic creamed spinach is priced à la carte. From appetizers with New Orleans flair, such as shrimp in a catch-up-with-you spicy rémoulade, to potatoes served six different ways, each dish is richly satisfying. For those who can handle a King Kong-size portion of steak, the bone-in cowboy rib-eye is a huge, thick cut, but the petite filet will satisfy most appetites, particularly if you opt for the version topped with jumbo Gulf shrimp. Chicken, fish and lamb entrées are available, and vegetarians can load up on sides, but this cozy, sprawling restaurant is truly the domain of meat lovers. As you might expect, the wine list is dominated by bold reds, and desserts are homemade and just this side of sinful.